– I would switch the line 41 and 42 as it looks a little strange to have the pool object treated at line 40 and 42 and to have a surface object created at line 41 with nothing done to it at line 42 but then used at line 43. – I find curious in your example is that nothing bind the surface to a display.. Did I miss something? 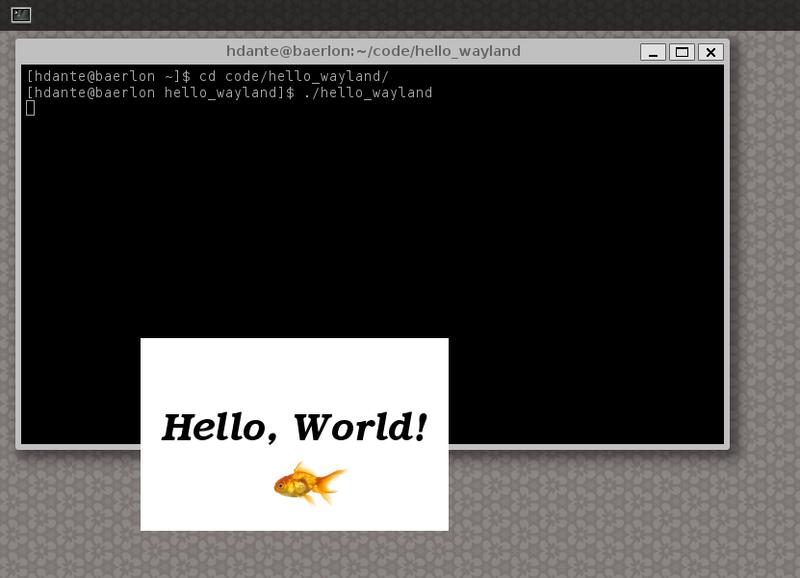 Waiting for the 2nd tutorial, I’m delving into how to make a wayland compositor but I’m not sure where to start. It’s all confusing everywhere, I really wish if people like you would do the documentation for Wayland. Your explanation is giving me a foundation in this, can you please guide me in this/ write a blog to support the same. I found a typo “the values would be dinamically calculated”. Hello. Thank you for your example program. I don’t understand how do you calculate sizes. “capacity” is the size of the file “images.bin” in bytes. As far as I understand, you don’t transform graphics. The size arguments of “mmap” and “wl_shm_create_pool” are in bytes too. Why do you multiply it by “sizeof(pixel)”? Which is 4 because “typedef uint32_t pixel;”. BTW, what is the difference between the “capacity” and “size” fields of “struct pool_data”? They both seem like a size value. Hello beroal, I don’t remember the code very well but I know the size calculation was messed up because I have switched multiple times between using byte counts and using pixel counts. In the mentioned example, I believe the code is bugged. The memory being allocated is much larger than what’s needed. In the code, capacity is the allocated size, while size represents only the useful data. The size may grow while using more memory up to the capacity. I just come up with your post, i find it really great, thank you. by the way, did you find the time to make the part 2 of the tutorial ? Thank you! Yes, entering the cc command and options manually works (I did try that before in effort to troubleshoot before posting my comment, but apparently messed up the options). Hm, PKG_CONFIG_PATH is correct in my .bashrc and echo $PKG_CONFIG_PATH seems correct (/home/me/install/lib/pkgconfig/:/home/me/install/share/pkgconfig/). I’ll dig into this via other online forums, but if anything seems obviously wrong to you, I appreciate any tips. Thanks again for the hello_wayland tutorial! In hello_setup_wayland, why is wl_display_connect passed NULL? Doesn’t a fd need to be obtained first, which should then be passed to wl_display_connect? Never mind, I was looking at wl_display_connect_fd. How to know if my application is running in Wayland ? The minimum that the application should do is to connect to a wayland server with wl_display_connect(). When you receive a display object, you’re using wayland. To see on the shell if a wayland server is running, you can open a terminal and look for the WAYLAND_DISPLAY environment variable. If it’s not empty, then a wayland server should be running.